The most important part of any presentation is the content, not the graphical appeal. That is why you should develop your presentation with the content first, before deciding on the look (colours, graphics, etc.) Create a good structure for your presentation by reflecting on the goal of the presentation (more details in this article), what your audience is thinking right now, and what points you need to make in order to move the audience from where they are to where you want them to be (like a GPS). Write an outline on paper or use sticky notes so you can move ideas around. By creating an outline first, you ensure that the content of your presentation is solid before you concern yourself with the visual elements. Here are links to some articles that deal with common types of presentations: Status Update, Presenting a Recommendation, and a Sales presentation. If you want your audience to be able to see what you have on the slide, there needs to be a lot of contrast between the text colour and the background colour. I suggest a dark background with light text – I usually use a medium to dark blue background and white or yellow letters. Some prefer a light background and dark letters, which will also work well - which you choose will depend on personal preference. Don’t think that just because the text looks fine on your computer screen that it will look fine when projected. Most projectors make colours duller than they appear on a screen, and you should check how your colours look when projected to make sure there is still enough contrast. To check that your colors have enough contrast, use the Color Contrast Calculator. Use the tool in this article to take into account the challenges of those who have color deficiency. When text comes on the screen, we want the audience to read the text, then focus back on the presenter to hear the message. If the text moves onto the screen in any way – such as flying in, spiral or zooming – it makes it harder for the audience members to read since they have to wait until the text has stopped before they can read it. This makes the presenter wait longer between each point and makes the audience members focus more on the movement than on what is being said. I suggest the use of the "Appear" effect, which just makes the text appear and is the easiest for the audience to read. This article explains how proper use of builds helps focus the audience. So you don't have to stand beside your computer to advance each build on the slide, use this remote, the one I have relied on for over a decade. Every two years I ask audiences what annoys them about bad PowerPoint presentations. The latest survey confirms that audiences are more fed up than ever with the overload of text on slides (see the latest survey results here). Instead of using slides that only contain text, use visuals such as graphs, diagrams, photos and media clips to engage the audience (see the SlideShare below for some ideas). I've developed a method for selecting visuals in my book Select Effective Visuals. Do you use Excel data in PowerPoint? If so, read this page with advice on presenting financial information effectively. If you do use a text slide, don't use the default bullet point layout. You have better options, like the ones shown below. 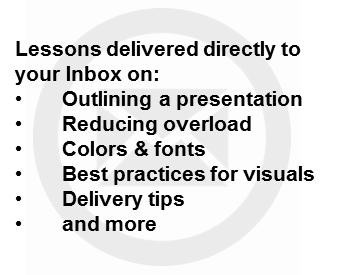 Check out my e-course Alternatives to Bullet point text. Sometimes we want the image on the screen to disappear so that the audience is focused solely on the presenter. There are two ways to do this. The first is if you want to blank the screen with a black image, similar to shutting the projector off (we used to do this all the time with overhead projectors by just shutting the projector off). Just press the period key (.) on the keyboard and the image is replaced with a black image. Press the period key again and the image is restored. This article explains three uses for a black slide that blanks the screen. Using a remote, such as the one I rely on, allows you to blank the screen without having to be at your laptop. Sometimes it can be valuable to be able to draw on the screen during your presentation to illustrate a particular point or item. This can be done in the following way. Press the Ctrl-P key combination to display a pen on the screen. Then, using the left mouse button, draw on the slide as you wish. To erase what you have drawn, press the E key. To hide the pen, press the A key or the Ctrl-H key combination. When you employ these secrets to use PowerPoint effectively, you will greatly enhance your audience’s understanding of your message and help to make your presentation the best it can be. One of the most common requests from presenters looking to deliver more effective presentations is how to create a presentation the audience will understand and act on. My book "GPS for Presentations" shows you a method for planning your presentation. Learn more and get your copy of GPS for Presentations. How do you know what visual to use to communicate a particular point? Start with my six category decision method explained my book Select Effective Visuals. When you are ready to learn how to create these effective visuals, get step-by-step instructions in my Implementation Guides. Are you looking for a customized workshop where your staff can learn to create PowerPoint presentations that have a clear message, focused content, and effective visuals? Click here to learn more about my customized in-house workshops. If you are an individual who wants to learn these skills at your own pace, check out my guided self-study course. Did you find this article helpful? If so, use the menus above to check out the great learning tools and free resources to help even more! Click here to e-mail a link to this article to others.